Okay: I didn’t win the blog category of that CLEO/Wonder Woman thing. In hindsight, I already knew this, but for a while there it felt like everyone in the world was voting for me and we’d all linked hands and started a wild mazurka of joy, spiralling with love for this blog and each other. And then I opened the July issue in a 24-hour convenience store at lunch today with Tim and the mazurka ceased, and David Dallas’ Big Time ended its chorus in my mind. (What’s a mazurka? You ask? Only one of the coolest folk dances ever, as this video confirms.) BUT as I’ve said previously, this has been a fun wave to flutterboard across and it was lovely being unexpectedly nominated, and of course, I’d like to extend a giant chocolate cake with “congratulations” piped across the top in icing to the actual winners at So Much To Tell You. I’m sure we all wanted this in equal amounts! I just felt particularly wanty, and this kind of obliterated any idea that anyone else could want it more and I wouldn’t win. But it’s okay. It was fun to be nominated. And to raise awareness of my desire to own a capybara. And a mightily enormous thanks to everyone that emailed in and voted for me: it means a lot! I don’t bust out folk-dancing imagery for just any old situation. Of powdered gelatine, Nigella Lawson authoritatively sneers “God knows how anyone can make that work…leaf gelatine is the answer“. It sort of has an implied “and if you want to consider yourself any kind of fan of mine, lowly blogger, then you ought to agree” tacked onto the end. 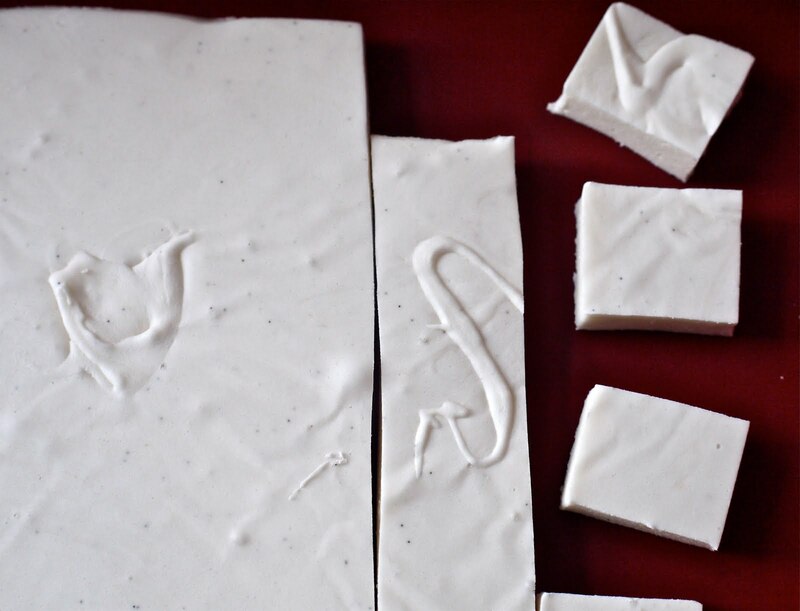 In some ways, Nigella is right – leaf gelatine is much more reliable and easier to use, and very pretty. But if a packet of Davis powdered gelatine hadn’t been sighing unwantedly in my cupboard, I would not have been able to make Moonshine Biffs: then what? My Mum gave me her old copy of the Edmonds Cookery Book, the 1971 edition I believe. It’s the sort of thing you don’t want to buy new, you want to be given it or find an old copy somewhere…I read once about how young people are able to have nostalgia for things they never knew – for things that their parents or even their grandparents experienced. Or even nostalgia for things that someone’s parents and grandparents might have experienced (ie: the 60s), which, if any of that makes sense, could explain why I get a feeling of warm safeness inside when I turn the pages of this book and read curtly delivered recipes for spiced rock cakes or Dolly Varden Cake even though I never, ever ate them growing up. As I was leafing through the pages I discovered the recipe for Moonshine Biffs and decided whatever the heck they even were, I was going to make them for their name alone (for the same reason I’m no good to play Scrabble with because I’d rather make silly words than gain points…and I get really impatient waiting for people to have their turn…And also I’m pretty sure I don’t really like Scrabble.) I thought they’d be like marshmallows but they are in fact, better yet, essentially Milk Bottle lollies in square format. From the Edmonds Cookery Book. Place gelatine, water and regular sugar in a saucepan and boil for eight minutes. This was a little scary, but because the Edmonds Cookery Book is always pretty vague, to put an instruction in italics made me want to follow it. That said, if you suspect your stove-top generates a significantly hotter heat than what they had in the 70s then go slow and boil a little less. Add the icing sugar and vanilla (I had some vanilla paste, proper extract would be fine, you could, I suppose, go era-specific and use essence) and beat until thick and white – I used a silicon whisk and nearly fainted from the exertion, you’re welcome to use electric beaters or whatever. Pour into a wet tin – again, silicon makes life easier here, otherwise use baking paper to line the tin – and leave to set for a couple of hours. It doesn’t matter if it won’t fill the tin – it’s not a huge mixture and just stops and sets where it is. Slice up, toss in coconut. FYI, mine set very smooth and coconut wouldn’t stick to one side of it. Edmonds didn’t prepare me for that but I was chill. As I said, these really do taste like Milk Bottles – chewy, a little creamy, very sweet. But good – so good. And they cost around 30 cents and a little arm-work to make. If your kids/flatmates aren’t snobs about what shape their lollies come in, try them on a rainy weekend and see if you don’t feel awesome about yourself and the world once you have a pile of them sitting on a plate in front of you. On a gelatine rampage, I couldn’t help trying something else further down the page: Toasted Honey Marshmallows. Significantly more sophisticated, these intensely honeyed, soft sweets would be perfect after a spicy dinner or alongside liqueurs and truffles instead of pudding. There’s no getting around the fact that gelatine is not vegetarian, and is no less made of animal than if steak was the main ingredient of marshmallows, so if you are thinking of making either of these maybe check with your meat-shunning mates what their limits are. Also from the Edmonds Cookery Book. Soak 1 level tablespoon Gelatine in 1/4 breakfastcup cold water in a metal bowl for 3 minutes. Dissolve over hot water, by sitting the metal bowl on top of a small pot of simmering water. Tip in 1 breakfastcup liquid honey. Beat with egg beater (or whatever you have – again, I derangedly used a whisk) until fluffy and white – about ten minutes. Turn into a wet shallow tin (again, silicon is best here) and leave 24 hours. 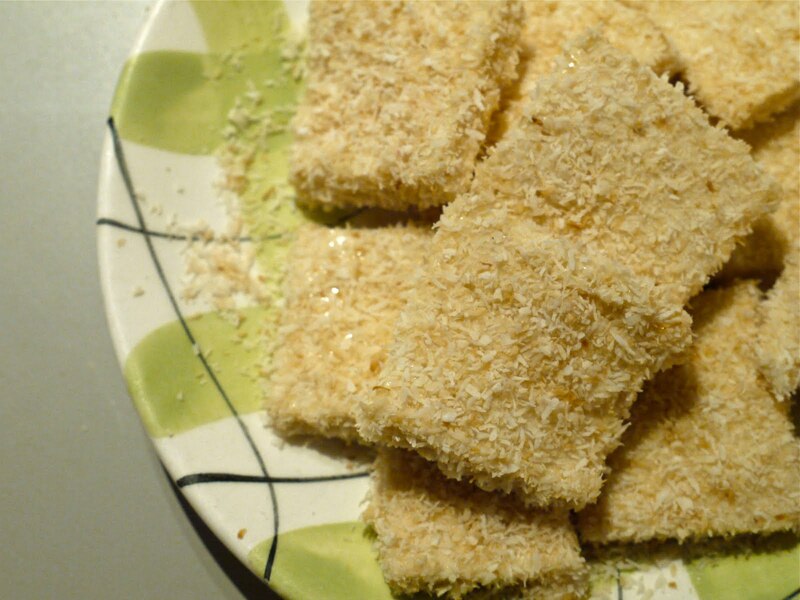 Cut into squares carefully with a sharp knife and roll in toasted coconut. Yes, you have to wait for ages which is why these are less child-friendly, but as I said the flavours and textures that unfolded from such minimal ingredients were incredible. 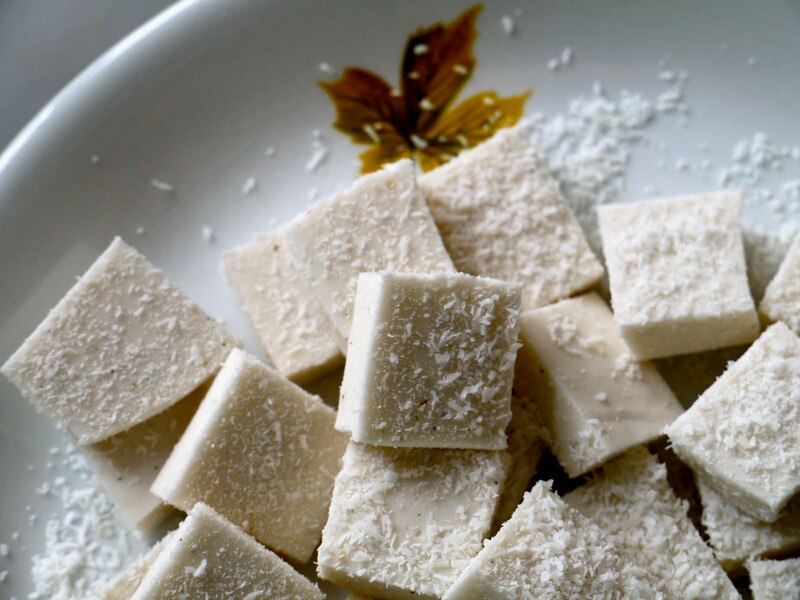 The taste of honey suspended within impossibly soft marshmallows against the damp, nutty and textured coconut was amazing. Last week Tim and I, having read several two-thumbs-up reviews, went to see Cemetery Junction. Even though it all ties itself up nicely and eventually good things happen to all the good people, it’s done in a way that makes you quite happy to be taken along with it. It’s gorgeously filmed with some rollicking humour coinciding with those wonderfully quietly heartbreaking moments that the British seem to have patented, it’s full of good-looking, shiny-haired young Brits (although solemnly countered by some more menacingly lived-in faces) and it’s directed by Ricky Gervais and Stephen Merchant so, hello. We recommend it heartily. Title comes to you via: Queen’s Killer Queen…I know they’re not that cool, well neither am I. There’s a lot of Queen I’m not keen on, luckily this song isn’t in that list because I’m yet to see a better lyric about a setting agent. Fats Domino’s Ain’t That A Shame…the way the chugging opening melody slides into the titular question really does somehow convey a sense of something being a shame, besides that it’s a great, great song and I love Youtube for making all this old footage available. Julia Murney singing People from the musical Funny Girl…I guess I do mention her more than occasionally but friends: this woman is amazing. The bad thing about being a Julia Murney fan is that while she performs a lot she’s relatively below the radar and will never come to New Zealand and I’ll never get to see her in New York, the good thing about being a Julia Murney fan is that she performs a lot of fabulous songs at benefits and concerts and they often find their way to Youtube. And uh, looks like it’s the salute to Youtube segment on the show now. Next time: I’ve been promising pavlova for a while but excitement about homemade marshmallows overrides anything else. Including whether I really have any true need for marshmallows. Pavlova truly will be next time, promise. Also, you’re still most welcome to check out Tim’s and my side-project blog 100s and 1000s, where so far we’ve interviewed Grayson Gilmour, talked about new music we may or may not like, and I managed to winkle an Idina Menzel reference in there. Sigh. 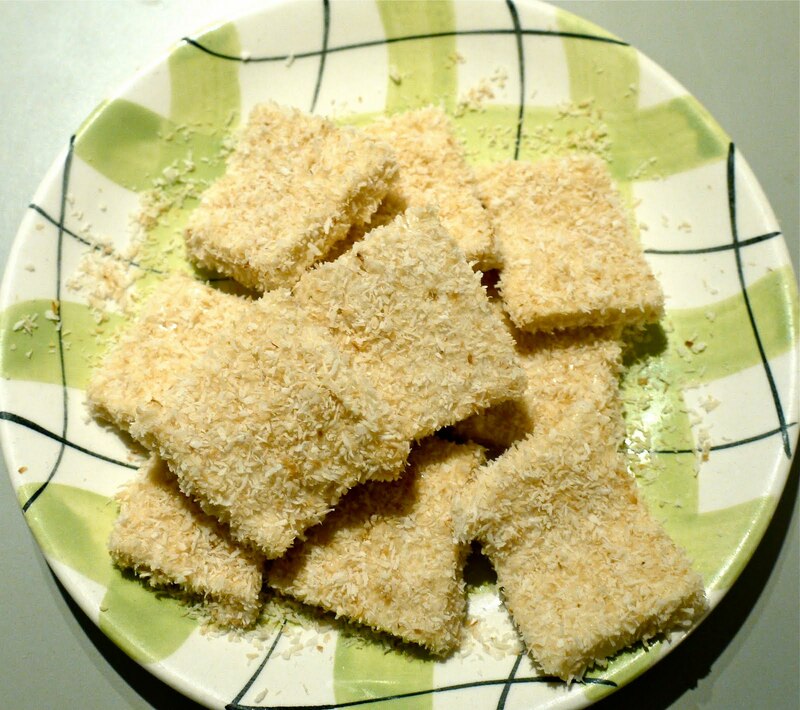 These sound delish – sadly my vegetarian tendancies mean no gelatine for me. I always have a mini spaz attack of joy in the supermarket if I find a packet of lollies/marshmallows without it. I loved Cemetery Junction too! The British do comedy (with just the right amount of poignant/moving thrown in) so well. Jervais is a genius. Oh and pavlova! I made one today for my Dad's birthday cake and they are such a labour of love – my arm was so close to falling off from excessive beating but it was so good. I am the pavlova master. So much so that it was all gone before I got the chance to take a picture and blog it! PS. Sorry, I never intend for my comments to be life story length. Hello from Queenstown where the mountains have a cookies and cream appearance and the temperature is cold enough to easily set your gelatine. Thought you'd appreciate the imagery. Well done for getting as far as the June edition of said magazine. Glad you're getting mileage outta the good old Edmonds cookbook. You was robbed! Robbed I tells ya! 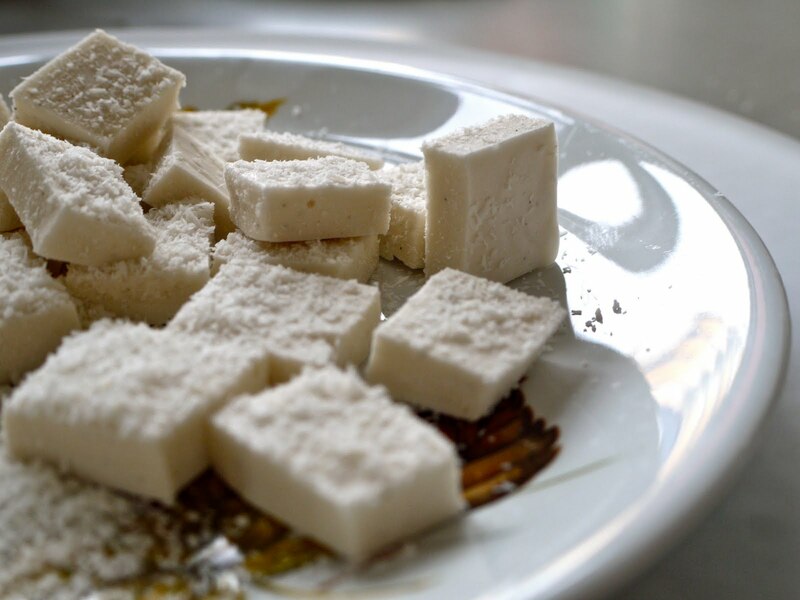 Seriously, how could anyone overlook someone who makes their own marshmallows?! ROBBED! If you post me over some homemade milk bottles, I'll go egg the Cleo editor's house for you. Fair trade, right? My mother first made these in about 1950, maybe earlier, she got the recipe from a cookbook published by The Mothers and Babies Assoc. in Australia. I keep forgetting the recipe, but it is the best marshmallow I know for Easter Bunnies. I specifically remember the eight minutes that you boil the mixture on the stove for.